A lecture series by Lars Brownworth covers the history of the Byzantine Empire through the study of 12 of its greatest rulers. The series begins with Diocletian and his reform of splitting the Roman Empire into east and west in 284 AD and ending with Constantine XI's death in battle as Constantinople fell in 1492 AD. Emperors covered include Diocletian, Constantine, Julian, Zeno, Justinian, Heraclius, Irene, Basil, Alexius, Isaac, and Constantine XI. 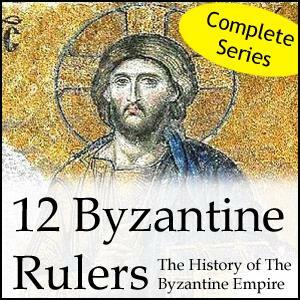 12 Byzantine Rulers is one the earliest history podcasts and set the standard for everything that followed.